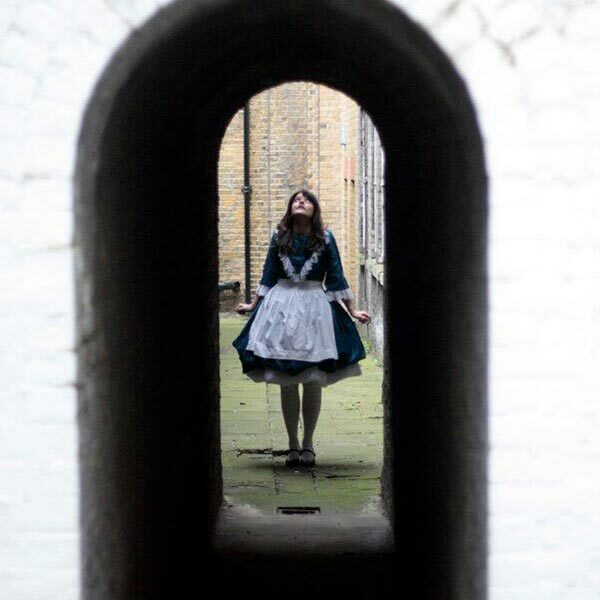 This week’s immersive theatre adventure took place down a staircase, through a basement pathway lined with wonders, and then straight down the rabbit hole to Wonderland for David Winder and Andrew Lynford ‘s adaptation. It’s not often you can describe theatre as being great fun, but this was just that. It was absolutely hilarious, clever, imaginative, and wonderful fun. The evening begins with a slightly disorientating walk around the garden of St.Paul’s – a walk which did need a little love and fixing up, but the clock arch was a very neat touch, as was the text on the ground. The evening takes place in several different locations in what is not a large garden, but the way the locations are spread out, it’s completely convincing that we are traveling around Wonderland with Alice. There were people of all ages enjoying this show – an octogenarian was laughing next to me, while I was laughing with my mates (in their 30s) and watching children hysterically laughing at the same time. The actors are actively having fun, and giggle along at the unexpected. Their interactions with audience members add to the fun of the evening – expect to participate in a croquet game and or run around crowing like a bird. The level of talent was a pleasant surprise. There are elements of the evening which are juicily pantomime in style, but the actors were wonderful across the board. Laura Wickham’s Alice was delightful – her facial expressions were endearing, sweet, and she embodied Alice wonderfully. Her signing voice was exquisite, and while there were some problems with projection during the evening, she never experienced them. The singing was one of the best bits of the evening – in particular the sorrowful mock turtle song and the frustrating catchy caterpillar theme song. The show stealer for me was David Baynes, who was nothing short of outstanding as the Hare and the Queen. His portrayal of all his roles had the audience in hysterics – particularly in his turn as a grumpy Glaswegian Hare. The various locations for the different scenes are kitch on the surface, but really very clever. The tea party set up (which is effectively people holding a sheet) is brilliant in it’s simplicity and effectiveness. There is also a very smart use of the church for showing perception. The Caterpillar’s area was a particular favourite- and when it gets dark, and the string lighting comes on, you fully believe you are in a wondorous, magical world. The groups are moved around well and there is a lot of excitement in following Alice’s journey. The ending – taking in place inside the incredible church – was fantastic. The lighting was excellent, and allowed for a surprisingly moving ending given how lighthearted the subject matter was. There is so much fun to be had here. Iris Theatre certainly have their hearts in the right place, and worked so well with the site to create the closest thing to Wonderland that this reviewer has ever seen. This is on for one more night (run ends Aug 31st) – please go see it. Tickets and info here. This entry was posted in Immersive Theatre, Theatre and tagged Alice in Wonderland, Iris, Review, St. Paul's Covent Garden. Bookmark the permalink.